Last month, when I shared my favorite homemade coconut cream popsicles recipe, I was overwhelmed by all the commenting, sharing, and pinning that followed. Thanks for that warm welcome! I hope some of you made the popsicles and enjoyed them as much as my family does! Well, today I’m back with another recipe (three recipes, actually) that I hope you’ll love as well – easy homemade applesauce in plain, cinnamon, and mixed berry flavors. Honestly, I hadn’t given much thought to making my own applesauce until recently. I’ve always bought organic unsweetened applesauce that was fairly affordable and had a short and simple ingredient list: apples, water and vitamin C.
Does corn syrup and MSG really need to be added to a batch of pureed apples? Sheesh! I knew I could do better and make my own homemade applesauce. 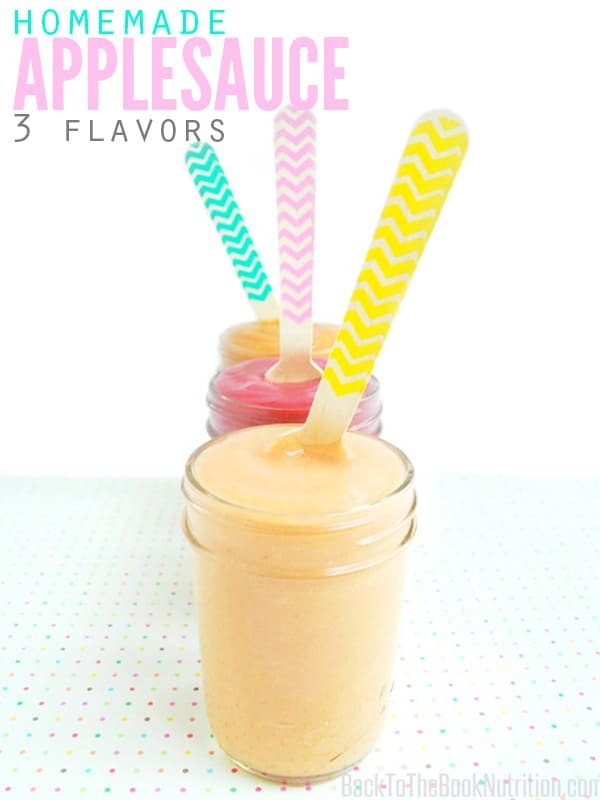 Homemade applesauce tastes really, really good!. The depth of flavor was outstanding – far better than store-bought varieties. And that silky smooth texture… you’re gonna love it! It’s easy. Quarter some apples, heat them in a pot with a few other goodies, blend. Done. It’s fast. Literally 25 minutes, start to finish. It stores well. It keeps in the refrigerator for at least a week, and large batches can be frozen and defrosted as needed. You can control the flavor and sweetness. I had fun fine tuning the amounts of each ingredient so that the end product came out just right! It’s a great way to put seasonal produce to good use. Whether you’ve been to an orchard to pick your own apples or are just wanting to take advantage of the better prices in-store, this recipe is an excellent way to enjoy the apple season. It’s a recipe that kids can help with. It’s simple, it’s fast, and they’ll love tasting it when it’s done! I tested these recipes on the stove and in the crock pot. The prep time was the same, but cooking time was much longer in the slow cooker (around 2 hrs versus just 15 minutes on the stove). I was also surprised by how the flavor varied between the two methods. The stove-top versions had a much lighter and sweeter flavor than crock pot method. I really don’t see a benefit to using the crock pot for this recipe, unless you’re cooking other food at the same time and just don’t have a burner free to cook the apples. Personally, I leave the peels on produce whenever I can to get the extra fiber and phytonutrients. Plus, I also love the pinkish color that the red apple peels add to thee recipes! 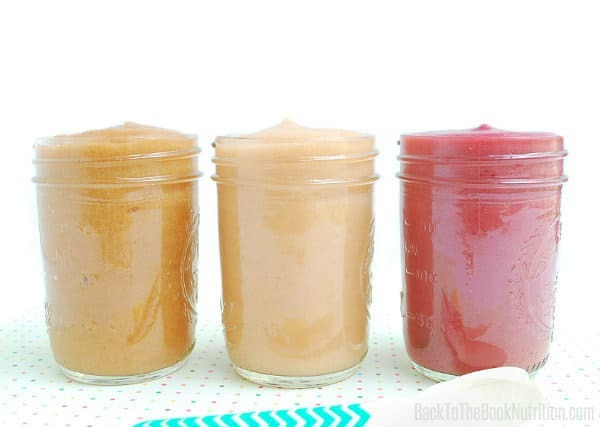 When the applesauce was ready, I pureed it in my Vitamix to give it a silky smooth texture. The end result is so smooth, you can’t even tell the peels are there! You might consider peeling your apples if you don’t own a high powered blender in order to achieve the same silky smooth texture. Peeling the apples also helps if you prefer a chunkier applesauce and don’t want to have pieces of peel swirling around. The flavor possibilities are endless… in fact, developing these three flavors got me thinking about all the different varieties we could make using seasonal produce or my children’s favorite fruits. But for today, we’ll keep it simple with plain (unsweetened) applesauce, cinnamon applesauce and mixed berry applesauce. Quarter the apples, remove core, and chop into 1 inch cubes. Place apple cubes and other ingredients in a saucepan and stir to mix. Heat over medium high heat until mixture begins to bubble. Reduce heat to a low simmer and cook, partially covered, for around 15 minutes (apples should be very soft, but not mushy). 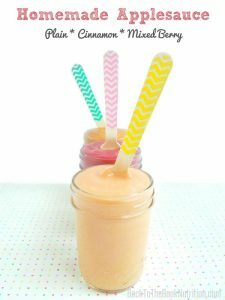 Transfer mix to a high powered blender. Blend on lowest speed for about 20 seconds, then gradually increase speed until entire mix is completely smooth (2-3 minutes total). Quarter the apples, remove stem and core, and chop into 1 inch cubes. Using a high powered blender (I have a Vitamix and Tiffany has a Blendtec) is the key to achieving the light and creamy texture. If you don’t own a high powered blender, a regular blender or immersion blender will also work, but the texture may be a little different. Let’s run through the prices for all three homemade applesauce varieties, comparing the price of using conventional vs. organic apples (and berries too). I compared prices of apples and berries at Costco vs. my local grocery store (HEB). The remainder of the ingredients were purchased at HEB, and generics were selected when possible to save money. The prices shown could probably be reduced a few cents more by purchasing these additional ingredients in bulk at Costco as well. The organic unsweetened store-brand (HEB) I typically buy is $0.44 per serving. It comes out ahead on the pricing, but it can’t hold up to the flavor and texture of the homemade version. As for cinnamon and berry, my store does make “clean” varieties of both cinnamon and berry flavored applesauce that are both cheaper than my homemade version. Unfortunately, we don’t really like the flavor of the store-brand, but we loved the flavor of the homemade cinnamon and homemade mixed berry applesauce! I may continue to buy store-bought plain applesauce for the sake of cost and convenience. But the smooth and delicious homemade cinnamon applesauce and mixed berry applesauce will be fun treats from time to time! Note from Tiff: Although store-bought comes out ahead in pricing, making your own is a really great way to control the texture and ingredients. Since applesauce can act as a partial substitute for fat in many baked goods, it’s worth considering making if you go apple picking or come across an abundance of apples. Even more so if you struggle finding good quality (and affordable) fats in your area. Make a day of making applesauce, can it, and you’ll have it ready for you year-round! Have you ever made homemade applesauce? What are your favorite flavors? Dena Norton is a registered dietitian (RD) turned stay at home mom. She and her husband, Rick, have two precious children, ages 5 and 2. She recently released the 2nd edition of her e-book entitled, Nutrition By The Book, and blogs at Back To The Book Nutrition, where she inspires others to enjoy and worship God through nutrition and health. Subscribe to Dena’s blog or join her on Facebook, Twitter, Instagram, and Pinterest! To read more posts by Dena here on Crumbs, click HERE and scroll down! I made crabapplesauce this year, added some cinnamon and cloves along with some sugar, and its been a huge hit with both my adult kids and young children of a friend! Definitely going to do it again. The cloves sound like a wonderful addition, Marie – thanks for sharing that idea! I tried this recipe yesterday and it was delicious! Made the berry flavor, but with fresh strawberries, as we are in Spring here and strawberries are really tasty. Thanks for sharing it, I’ll definitely make it again. So glad to hear you liked the recipe, Celes – I’m sure the fresh strawberries were fantastic! I like that you included three different flavor options. I linked to this in my Pancake Mix Fix post. Thanks for sharing. Thank you for sharing it, Melissa – I hope your readers love it as much as we do! How do you store your applesauce once it is done? You can store it in the fridge, freezer or can it! I typically just store it in a large glass jar in the fridge since we go through it pretty quickly, but you can also freeze it in small or large jars, as Tiffany pointed out…just leave a little space at the top to allow for expansion.